A man was arraigned Saturday on charges of attempted murder in a road rage attack against an Uber driver that was caught on a dramatic video. Keven McClean, 46, of Queens, was also charged with robbery, assault, reckless endangerment, leaving the scene of an accident and menacing. Bail was set at $100,000. It wasn't immediately clear whether McClean had an attorney. Video shows a man being pinned between two cars in the middle of a busy Brooklyn street. The victim, an Uber driver who wanted to remain anonymous, said he was driving on a bustling Norman Avenue in Greenpoint when another driver in a white car with Florida license plates started screaming at him, then cut him off. "I didn't know he was gonna hit the gas," the victim said Wednesday. 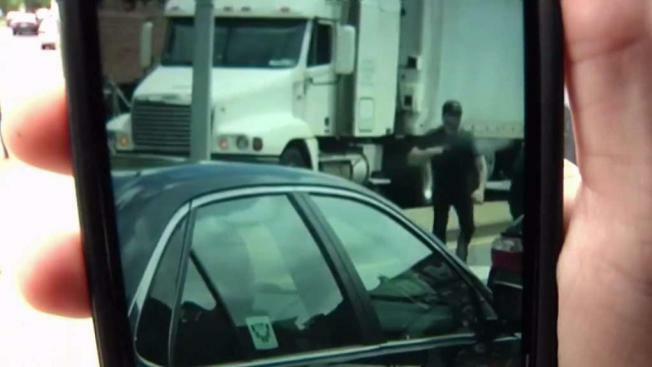 The NYPD said the incident is a good reminder that drivers should stay in their vehicles when encountering other aggressive drivers and take down the information of the other driver, if necessary.